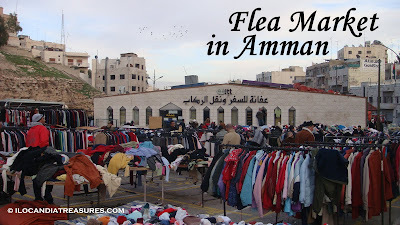 Flea market is a type of bazaar where second hand goods are sold at very cheap prices. It is called flea market because it was observed that buyers and sellers were active like fleas. They sometimes say that the original people and goods were infested with fleas. It is sometimes called swap meet, weekend market or car boot sale. This market can be held in an indoor or outdoor venue. It could be in a warehouse, gymnasium, tent, field or plaza. It is usually an open-air market. After visiting Jerash, I dropped by to this weekend market that has so many second hand merchandises from jackets, boots, shoes, and including food. I wanted to buy boots but there was no available size for my feet. It takes some patience to do a good buy. You have to really get all around moving like a flea to get what you wanted. Aside from the ready to wear items, food and snacks were on sale too. I bought from here a box of candied dates which is lower in price as compared to the supermarket. I bought a souvenir Islamic prayer bead necklace. I have seen here some Pinoys who do shopping every Friday which is also their day off from work.